The insubordination of the Janissaries had continued after the accession of Amurath, but at length, by their own moderation and submission, they restored peace to the distracted Empire. Its affairs had altered so much for the better, that Sir Thomas Roe, in a letter to Sir Isaac Wake, April 6th, 1628, observes “My last judgment is that this Empire may stand, but never rise again”. In 1632 the Janissaries attempted another abortive revolt, and after this period Amurath IV displayed a cruelty and bloodthirstiness which had not before been observed in his character. From that year to 1637, he is said to have put to death 25,000 men, and a considerable number of them with his own hand. The attention of Amurath was diverted from the affairs of Europe by his wars with Persia and the Druses. In 1638 he captured Bagdad, which had been fifteen years in the hands of the Persians; when he caused several thousand prisoners to be slaughtered before him as he sat upon a throne. In June, 1639, he entered Constantinople in triumph. But his constitution was already broken through fatigue, excitement, and debauchery; and being seized with a violent fever, he died February 9th, 1640, at the age of thirty. Amurath was succeeded by his brother Ibrahim, whom he had ordered to be put to death. Ibrahim, now in his twenty-fifth year, would willingly have declined the diadem. The change of rule, however, was tranquilly effected; and with the hope of enjoying better times under the new Sultan, even the Janissaries and Spahis were tranquil. Ibrahim, though not altogether destitute of talent and mother-wit, soon betrayed a total want of princely dignity, and passed his days in the inmost recesses of the harem, with women, jugglers, and musicians. At the beginning of the new reign peace was renewed with the Christian Powers, many of which, as England, France, Venice, and Holland, now maintained resident ambassadors at the Porte. The only relations which seemed to threaten hostility were those with the Emperor; but in March, 1642, the peace between the two Powers was renewed at Szony. The only open war waged during the reign of Ibrahim was that with Venice. In spite of many disputes between the Venetians and the Porte, the peace between these Powers had remained unbroken since 1573; but the bombardment of Valona by the Venetians in 1638, when in pursuit of some Barbary pirates who had taken refuge there, was an affront which the Porte found it difficult to digest, although Venice had expiated her offence by the payment of 250,000 sequins. In 1644 immense preparations were observed in all the Turkish arsenals, and it was readily and rightly conjectured that the object of them was Crete, the only important outlying possession that remained to Venice. The Turkish fleet, with a large army on board, the whole under the command of Yusuf, a Dalmatian renegade, left Constantinople in April, 1645. A landing was effected and the town of Canea taken; but the war dragged on several years, and it was not till 1648 that the Turks laid bootless siege to Candia, the capital of the island. The ill-success of this war, and especially the Turkish losses in Dalmatia, where the Venetians captured the almost impregnable fortress of Clissa, gave rise to serious discontent at Constantinople; most of the great officers of state, as well as the leaders of the Janissaries, rose against Ibrahim; the Mufti pronounced his deposition; and his son Mahomet IV, a child only seven years old, was saluted Sultan in his place (August, 1648). The unfortunate Ibrahim was soon afterwards strangled in the prison to which he had been committed. Although during the period we have been surveying no open breach occurred between the Empire and the Porte, yet the Turkish Pashas who ruled in Hungary supported Ragotsky, Voyvode of Transylvania, in an attempt upon Ferdinand’s dominions which had been stimulated by the policy of Mazarin. On pretext that the Emperor had violated his promises to the Hungarian Protestants, Ragotsky incited a revolt in that Kingdom, and the Austrians had great difficulty in maintaining themselves in Pressburg and some of the neighbouring Hungarian counties.Torstenson, after his victory at Jankowitz, united himself with Ragotsky (1645), threw a bridge over the Danube, and attempted to seize the Emperor at Vienna; but the wild and undisciplined troops of his ally proved rather a hindrance than a help, andRagotsky himself concluded a separate peace with the Emperor. Torstenson, who was so ill that he could travel only in a litter, was soon after forced to raise the siege ofBrünn. Being now determined to retire, he intrusted the maintenance of his conquests in Bohemia and Silesia to General Konigsmark, but subsequently devolved the chief command on Charles Gustavus Wrangel. His last feat, before his retirement, was the capture of Leitmeritz. In the boldness and decision of his military genius Torstensonmore resembled his great master, Gustavus Adolphus, than did any other of that King’s generals. He was accompanied in his last campaign by Charles Gustavus, son of the Palsgrave of Kleeburg, who was subsequently to mount the throne of Sweden, and who, in the school of Torstenson, became a distinguished commander. Negotiations for a general peace had been already opened. Ever since France had taken up arms, Pope Urban VIII. had not ceased to press that Power to abandon the Protestant alliance and reconcile herself with the House of Austria. In 1636 Urban had so far succeeded as to induce some of the Catholic Powers to treat at Cologne, whither he dispatched Cardinal Ginetti as Legate and mediator; but, though the Emperor and the Catholic King sent representatives to Cologne, France declined to do so, regarding the assembly only as intended to separate her from her Protestant allies, the Swedes and Dutch, who could not be expected to treat under the mediation of the Pope. The Count of Avaux and John Adler Salvius, the ministers of France and Sweden, had renewed at Hamburg, March 15th, 1638, for three years, the alliance between those countries, with the express provision that neither should enter into a separate peace; and, as at the commencement of 1641 the prospect of a general peace was as distant as ever, the alliance was again extended till such a peace should be effected. Meanwhile the Emperor had conceived the impracticable design of treating with the States of the Empire alone, without the participation of foreign Powers; and it was with this view that he had summoned a Diet at Ratisbon in 1640; where, as already related, he had been so nearly captured by Baner. At length, in December, 1641, preliminaries were arranged at Hamburg between Conrad von Lützen, the Imperial ambassador, and Avaux and Salvius on the part of France and Sweden. It was agreed that the towns of Munster and Osnabrück in Westphalia, which were to be declared neutral, should become the seats of two congresses composed of the representatives of the Powers directly or remotely interested in the war, that is, of most of the States of Europe. The reasons for choosing two towns were, because one would not have sufficed to accommodate the crowd of ministers who were expected to attend; and because it was desirable to avoid any collision between the Papal Nuncio and the Protestant plenipotentiaries, as well as any disputes concerning precedence between France and Sweden. Hence, as a general rule, the representatives of the Catholic Powers were to assemble at Munster, and those of the Protestant Powers at Osnabrück, but the Dutch plenipotentiaries were to treat at Münster with the Spanish, without any mediator; and as the affairs of the Empire were to come before both assemblies the Emperor was to be represented in both towns. The two congresses were, however, to be considered as one; and the towns mentioned were selected because they lay near each other, and had every facility of communication. The conferences were to have been opened in March, 1642; but more than a year was lost in squabbling about forms and points of etiquette. At last, in July, 1643, the Imperial plenipotentiaries opened the congresses, and the ministers of the other Powers began to arrive; but it was not till October that the Spaniards appeared: the Venetian envoy came in November, and the French plenipotentiaries did not arrive till April, 1644. The Papal Nuncio, Fabio Chigi, Bishop of Nardo, afterwards Pope Alexander VII, and the Venetian senator Contarini, who subsequently became Doge of Venice, took up their residence at Münster, as mediators between the Catholic Powers; while the King of Denmark, as mediator between the Emperor and Sweden, had dispatched to Osnabrück as his ministers Lipsius and Langermann. This attempt at mediation on the part of Denmark produced the war already related between that country and Sweden; and the functions designed for Christian IV.were ultimately transferred to Contarini. Never before had such an assembly of the members of the European commonwealth met together. Not only were the greater States represented, but ministers from the Electors, spiritual and temporal Princes, and great cities of Germany, whom the Emperor with much reluctance at length consented to admit, as well as from such Powers as the Duke of Savoy, the Duke of Mantua, the Grand-Duke of Tuscany, nay, even from Catalonia, newly revolted from Spain, also appeared at the congress. The quiet little town of Münster, a century before the scene of the strangest suppression of all social distinctions, was now enlivened with Court ceremonies, splendid banquets, and the equipages of prelates, princes, and ambassadors; while the Papal Nuncio might behold, suspended from the tower of St. Lambert’s church, the bones of that fanatical heretic who for a brief period had enjoyed a more absolute sway over his followers than had ever fallen to the lot of the haughtiest Pontiff. One nation alone accustomed to play a great part in the affairs of Europe was conspicuous by its absence. England was unrepresented in these important transactions. The civil troubles of that country had effaced her for a time as a member of the great European system. Considering the extent, variety, complication, and importance of the interests at stake, it was not to be expected that the negotiations for a peace should be brought to any very speedy termination; but a still more efficient and dangerous cause of delay was the insincerity of some of the chief Powers, who had engaged in them rather by way of homage to public opinion than from any wish for their success. The generals and ministers of these States loved the war for its own sake, as it gave them employment and made them of importance. France and Sweden were intent on seizing as large a share as possible of the spoils of the Empire, while the Emperor himself felt a repugnance to negotiations which he saw could be completed only by vast sacrifices on his part. Since the fatal mistakes committed by Ferdinand II in engaging in the Italian war and dismissing his army under Wallenstein, almost every year had been marked by signal defeats and losses. France had made herself mistress of Alsace and the Forest Towns, as well as of several places in Luxembourg and in the Electorates of Treves and Cologne: the Swedes occupied Pomerania, and had garrisons in Saxony, Westphalia, Bohemia, Silesia, and Moravia; and the Emperor might sometimes see with his own eyes, from the ramparts of his capital, the ravages of the enemy and the burning of his villages. A portion of his own subjects was in arms against him; another large part of the Empire, comprising the Electorates of Brandenburg and Saxony and the dominions of the Dukes of Lüneburg, had declared its neutrality; and Ferdinand III was thus reduced to recruit his armies from his hereditary dominions and those parts of Germany which remained faithful to him, now almost exhausted by the efforts and sufferings of so long a war. Yet he was still disposed to protract the struggle, and risk the fortune of events rather than immediately consent to inevitable sacrifices; and such were the instructions he gave to the Count of Nassau and M. Wolmar, his plenipotentiaries at Minister. Spain, also, mindful of her former grandeur and prosperity rather than of her present fortunes, could not persuade herself to make concessions to an enemy whom she both feared and despised. France, from the hopes of gain, adopted the same procrastinating policy. No sooner did the French ministers arrive at Munster than they began to raise questions respecting their right of precedence over the Spanish ambassadors, more for the sake of protracting the negotiations than with any other view; whilst the Germans, without any such motive, but merely from a puerile love of titles and distinctions, followed their example. The title of “Excellence”, a common one in Italy, borne by the Venetian minister, excited the jealousy of the Electors of Brandenburg and Bavaria, who insisted that their representatives were entitled to the same distinction; and when the Emperor conceded that title to such of them as were “persons of rank” (Standespersonen), new disputes arose as to who were to be included in that category! While the conferences at Munster were thus embarrassed by the French, those at Osnabrück were suspended altogether by the war between Sweden and Denmark, which rendered the latter Kingdom a belligerent instead of a mediating Power; and, as the French would not take a step without the Swedes, the negotiations were for a time arrested. Under these circumstances, it is not surprising that the proceedings of the congress were prolonged several years, and made dependent on the events of the war. Whilst Torstenson was pursuing his successes in Germany, as already related, the campaigns of 1644 and 1645 had also been favorable to France. 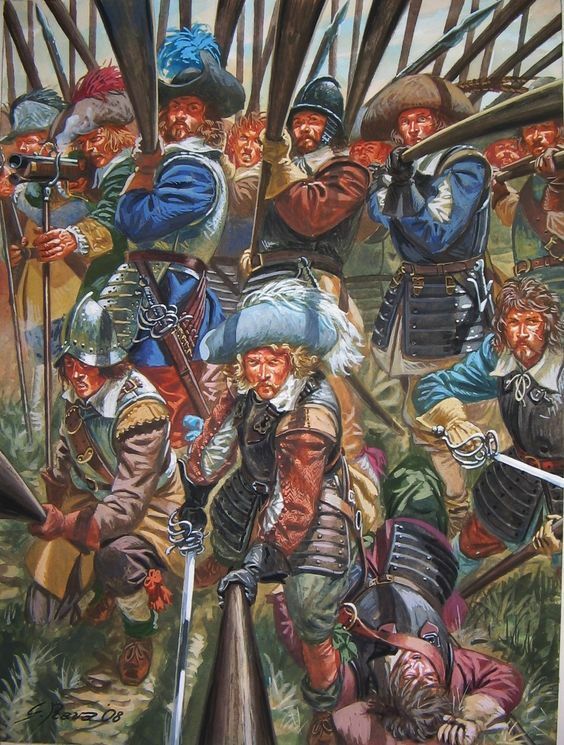 In Flanders the French, under the nominal command of the Duke of Orleans, but in reality under that of LaMeilleraye, Gassion, and Ranzau, captured Gravelines, after a brave resistance, July 23rd, 1644, while about the same time the Prince of Orange had taken the Sas of Ghent. Enghien and Turenne, having marched to the Rhine, attacked the Imperial general Merci at Freiburg in the Breisgau (August); and, though they were repulsed, Merci found himself compelled to retire into Würtemberg. It is on this occasion that Enghien is said to have thrown his baton into the enemy’s lines, a story of somewhat doubtful authenticity. Turenne and Enghien now descended the right bank of the Rhine towards Baden, and captured Phillipsburg, September 9th, where they found a hundred guns. Enghien established himself in this fortress, while Turenne, crossing the Rhine, took Worms, Oppenheim, and Mainz, without firing a shot. Bingen, Bacharach, Landau, and Kreuznach were also occupied by the French, who thus commanded the course of the Rhine from Basle to Coblenz. When Enghien entered Mainz, and to the Latin harangue of the chapter and municipality, replied with facility in the same language, he astonished the Germans almost as much as by his victories. The French campaign in Germany in 1645 was also brilliant, but chequered. Enghien, quitting the valley of the Rhine, entered that of the Danube, and laid siege to Nordlingen. Merci flew to its rescue, but was defeated on the heights near the town, August 3rd, chiefly by means of the German cavalry. Merci was killed in this battle, while John of Werth, abandoning his artillery, retired upon Donauworth. Nordlingenand Dinkelsbuhl now fell into the hands of the French, who were, however, soon obliged to retire on the Neckar. Enghien was compelled by illness to return into France, but Turenne recrossed the Rhine in November, captured Treves after a short siege, and reestablished the Elector in his capital, who, at the instance of the French and Swedes, had been released from his captivity in order to take part in the congress. The French arms had also, on the whole, been successful in the Netherlands. Mardyck,Linck, Bourbourg, Cassel, St.-Venant, Bethune, Lillers were captured; and, after forming a junction with the Prince of Orange, other places were taken; but before the end of the year Cassel and Mardyck were recaptured by the Spaniards. In Spain itself the French had not been so successful. 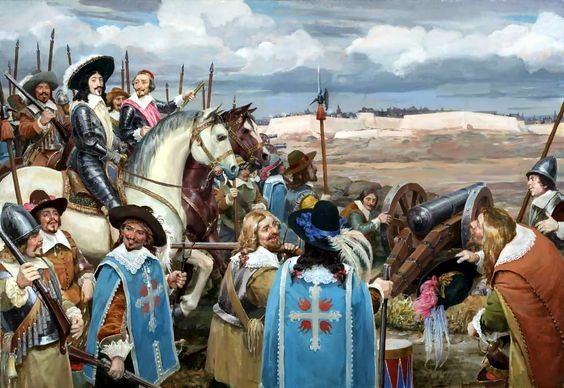 In 1644 they were driven out of Aragon, and Philip IV then undertook, in person, the siege of Lerida, which covers the western frontier of Catalonia, and defeated, with great loss, La Mothe-Houdancourt, whoendeavoured to defend it, May 15th. Lerida having capitulated, July 31st, the Spaniards next took Balaguer, and threatened Barcelona; but at this juncture Philip was recalled to Spain by the dangerous illness of his Queen, who died October 6th, and by the progress of the Portuguese in Galicia and Estremadura. In consequence of his ill success, La Mothe-Houdancourt was recalled to France and put upon his trial, and the Count of Harcourt was appointed his successor as Viceroy of Catalonia. In May, 1645, Du Plessis-Praslin took the important maritime town of Rosas; and Harcourt, crossing the Segre, defeated the Spaniards under Cantelmo at Llorens, June 23rd. That commander was also subsequently driven from Balaguer, which capitulated, October 20th.